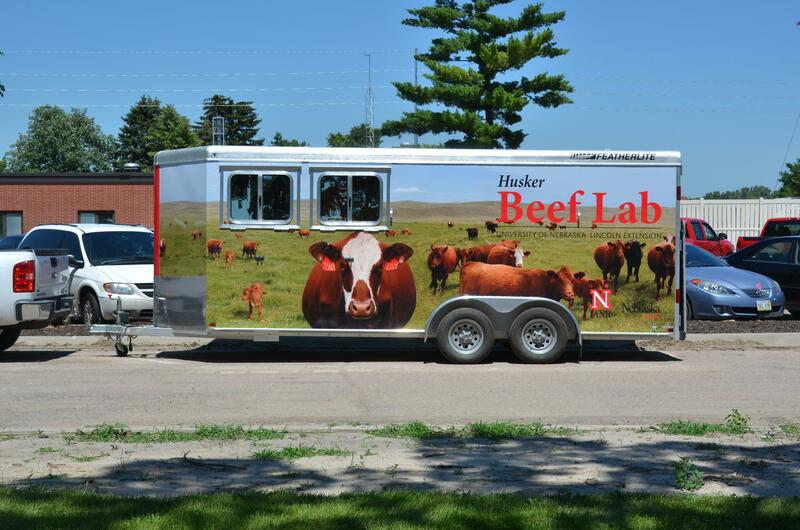 The Mobile Beef Lab, if you see us on the road be sure and wave – we are a friendly bunch! There are actually two of these labs in Nebraska, with the intent to educate! Each lab has one steer and a team of Educators. 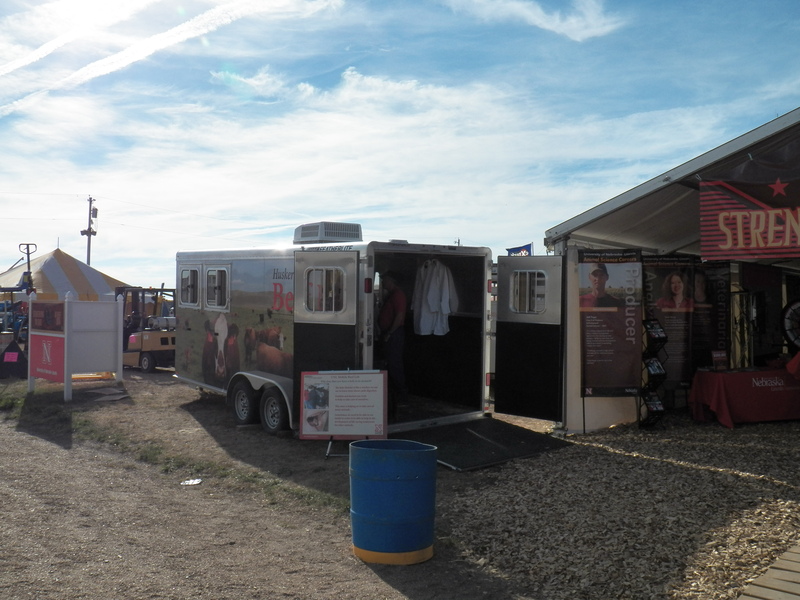 The Educators all have livestock backgrounds, so they know their way around an animal and a trailer. Additionally, everyone on the teaching team has been IACUC (Institutional Animal Care and Use Committee) certified. Every University that does research or education with animals will have an IACUC Office and people who regulate all use of these animals. The primary purpose is to ensure that the animals are well cared for; are not in pain or danger; and are being provided the best possible care at all times. To learn more about IACUC at UNL check out this page. These labs go to schools, fairs, festivals, and other community events. When we take the lab out we talk about microbiology, ruminant nutrition, food production, forage resource management, anatomy and physiology, animal care, and more! And the best part…you can put your arm through the hole to reinforce what you learned! 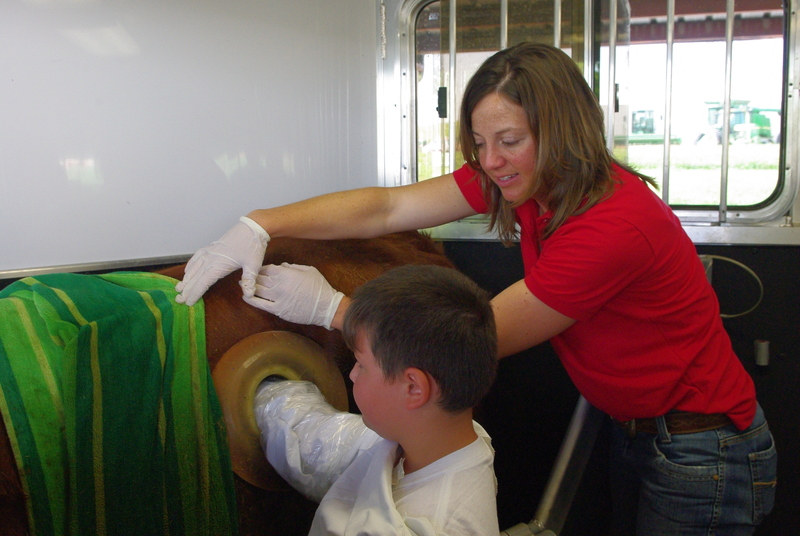 Heather helping a student understand what he is feeling inside the rumen. At schools we can set up microscopes. Students have a chance to remove a small portion of the rumen fluid and look at it under a microscope to see all of the microorganisms and their activity! 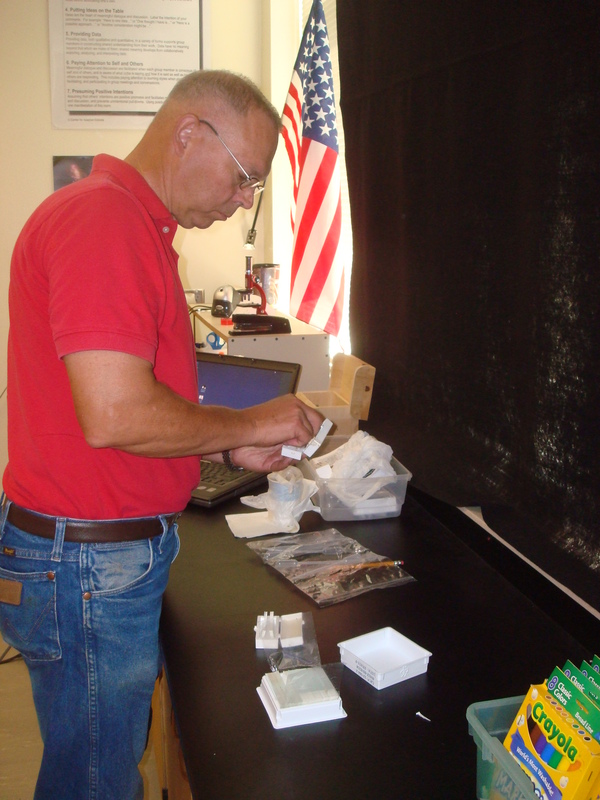 …or it can be set up in a classroom as Steve is assisting with here. Husker Harvest Days near Grand Island, Nebraska. The Nebraska State Fair in Grand Island, NE. 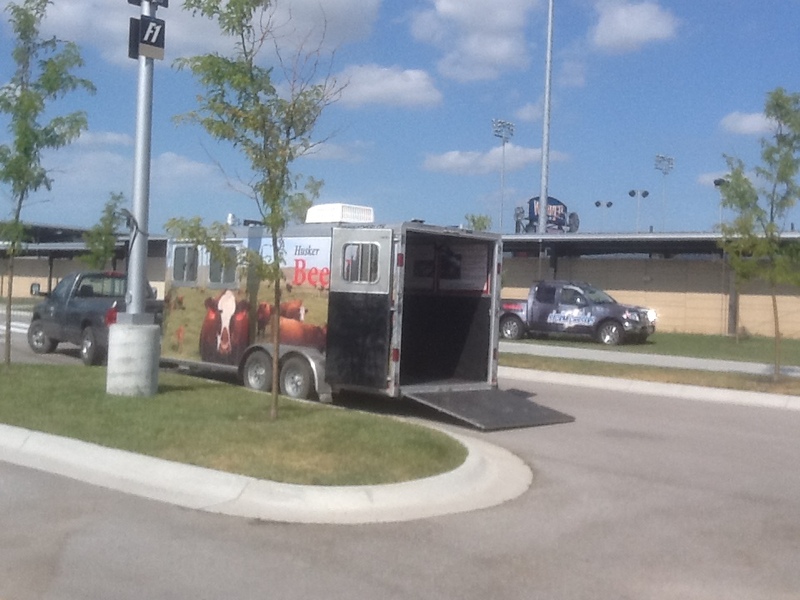 And Werner Park for a baseball game near Omaha, NE. Does it hurt? No, once healed it is like having an earring or a gauge in your ear. The steer doesn’t know it is there and he lives a completely normal life. He sleeps, runs, and eats just any other beef animal would. Fun fact: there are no nerve endings in their stomach, so they can’t feel our arms and hands in their rumen! 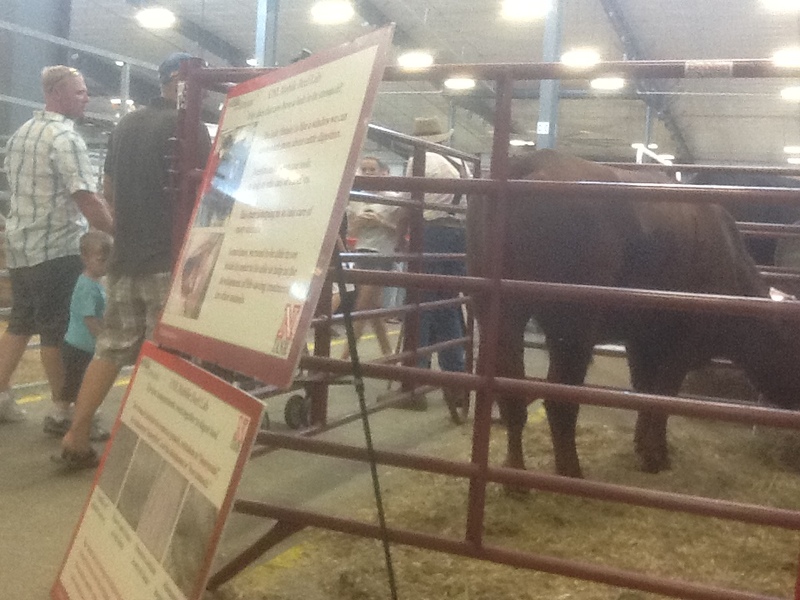 The steer eating from the bunk and hanging out with the State Fair Breeding Pavilion Heifers. He is very happy and healthy as you can see! How was that (aka the fistula) put in? 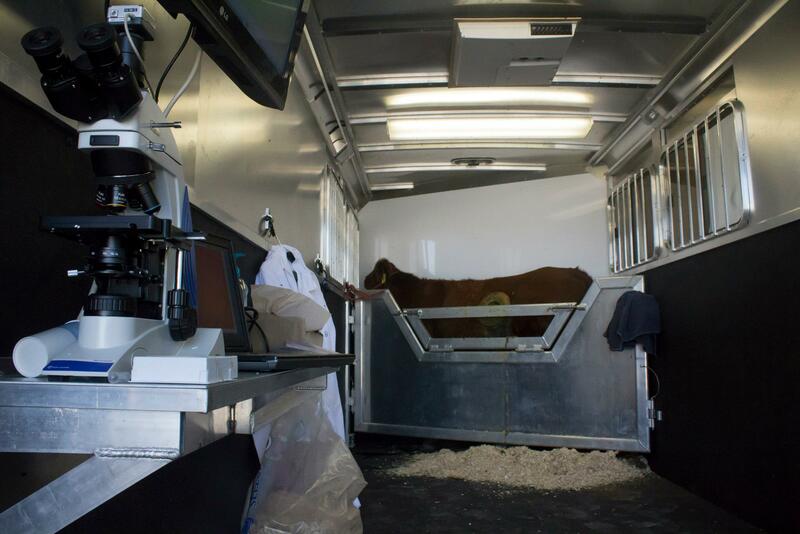 When the steer was about 500 pounds he underwent a procedure at UNL with veterinarians and veterinary students. Our teaching team was present and viewed the procedure (I didn’t think to get pictures when it happened a couple of years ago). They numbed the entire area with a local anesthetic (similar to what they would do to you at the dentist for a procedure) so he couldn’t feel anything. A small circle of the hide was removed, the muscle tissue was teased apart to get to the lining of the stomach. A small slit was cut in the lining of the stomach, and then the hide and stomach lining were stitched together. The fistula was inserted, and is a soft, pliable plastic devise that most similarly resembles a spool that thread comes on. 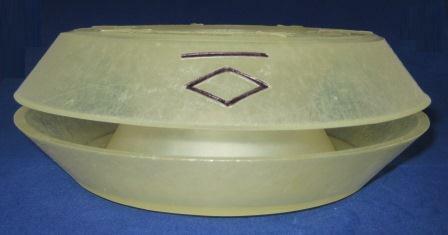 It is larger on the inside of the stomach and the outside of the body to hold it in place. Then a plug is inserted into the middle, which comes out and goes in (it very rarely ever falls out on its own, we have to always manually removed it and put it back in) to seal up the fistula when the steer is not being used. The steer’s pain was monitored until it was completely healed. An example of what the fistula looks like. How long will you keep the steer? We will keep him for years if we can. 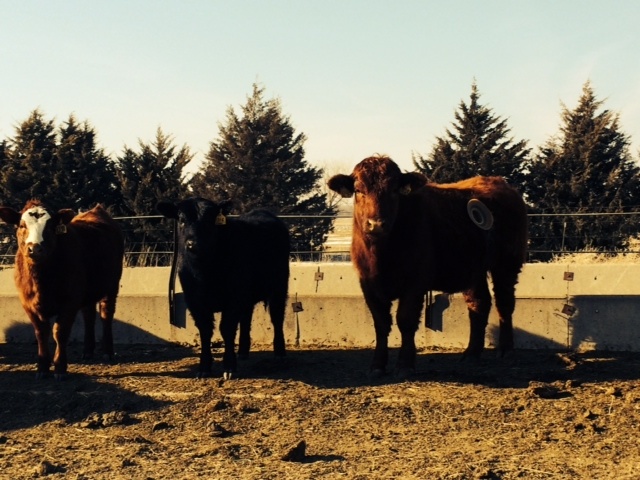 By having this procedure done the steer has become more valuable. He is also very tame, and he gets to meet lots of new people every year. As long as he stays healthy and maintains a good temperament we will keep him. We never want to put him or anyone who meets him in danger or harm. What happens when he is harvested? When he is harvested (slaughtered) for meat, it will be like any other beef animal. The fistula will be removed and the persons who harvest him will have to be very careful that none of the rumen content gets on the carcass, so as to maintain a safe food source. He will be harvested and processed just like any other meat production animal.